Today, December 7th 2016, is Larry Bird’s 60th birthday; Happy Birthday, Larry Legend! To mark the occasion, I’ve been trying to think of basketball video gaming topics that are related to the Boston Celtics great. Since I’ve already talked about Bird’s presence in NBA Jam Tournament Edition as a secret player, that idea is out. Glancing at the list of topics that I’ve compiled for future Wayback Wednesday features, I noticed one that’s probably overdue, and certainly has ties to Bird: NBA Legends in NBA Live 2000. I remember that many of us were very excited to hear that a selection of NBA Legends from the 1950s, 1960s, 1970s, 1980s, and 1990s would be featured in NBA Live 2000. The long-awaited addition of Michael Jordan was obviously a huge selling point, but the inclusion of Magic Johnson, Larry Bird, Wilt Chamberlain, Julius Erving, Isiah Thomas, and other all-time greats, also came as very welcome news for basketball gamers who wanted to see some historical content in NBA Live. As I mentioned in my retrospective, NBA Live 2000 is still considered to be a high point in the NBA Live series, and for good reason. Its gameplay was great for the time, it featured the series’ first fully-fledged Franchise mode, and it was quite moddable. It was also the first time that NBA Legends were featured in the game, with most of the big names from the league’s first five decades. In addition to All-Star teams representing the 50s, 60s, 70s, 80s, and 90s, there was a Legends Pool that allowed users to add those former greats to the current NBA rosters. 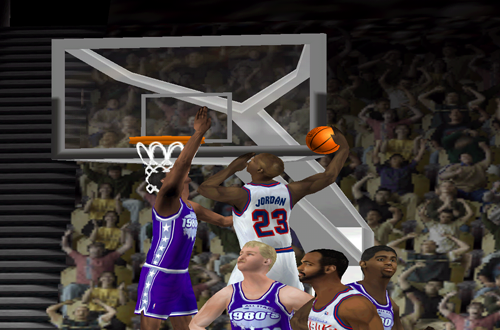 As noted above, Michael Jordan’s first official appearance in NBA Live also made it a big deal. Of course, with the lineup of historical teams in recent NBA 2K games, to say nothing of the production values of NBA’s Greatest and The Jordan Challenge, it might be hard for younger basketball gamers to appreciate the significance of the Legends in NBA Live 2000. Even some older gamers may wonder why it seemed like such a big deal, considering the kind of retro content that we now expect to see in NBA 2K. By today’s standards, NBA Live 2000’s approach probably seems like the bare minimum as far as historical content is concerned, focusing only on the big names rather than complete teams, and only adding five bonus teams to the game. What you have to remember is that everything has to start somewhere, and it was the first time that a new NBA video game had really celebrated the league’s history. 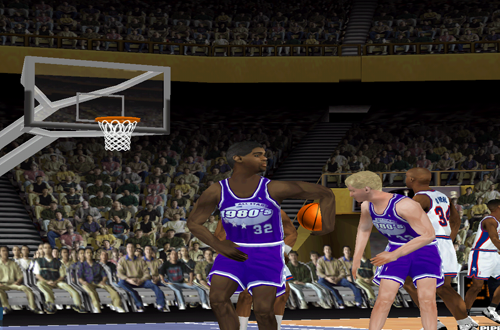 Sure, there were some hidden players in the Super Nintendo version of NBA Live 96, but they were basically Easter Eggs, in an era when players didn’t have proper face textures. It was great to finally have MJ in the game, but we were also excited to play with Larry Bird, Magic Johnson, Julius Erving, Isiah Thomas, Wilt Chamberlain, George Gervin, Bill Russell, and so on. It also made Legends and Champs roster patches much easier to make, since the big names were already there. I for one can say that I certainly miss the Decade All-Star teams in more recent editions of NBA Live, where Legends have only been playable in Ultimate Team (or in some cases, completely absent). NBA 2K is obviously much better in that regard, but I have to admit, I wish that the game had a separate Legends Pool for adding historical players to the current rosters, without having to remove them from their original teams. I also miss having Michael Jordan in NBA Live, but since he’s signed to an exclusive deal with Visual Concepts, there’s obviously nothing that EA Sports can do about that. Getting back to NBA Live 2000, the PC version was definitely the superior release when it came to the Legends. The entire roster of Legends was included and available by default, both on the Decade All-Star squads, and in the Legends Pool. In contrast, the PlayStation version featured all the Legends, but they had to be unlocked via codes. Alternatively, Michael Jordan could be unlocked by defeating him in the new One-on-One mode. This method also unlocked MJ in the Nintendo 64 version, where he was the only available Legend. Some websites reported that Isiah Thomas could be unlocked by tallying fifteen steals in a game, but as far as I can tell, that’s false. As most basketball gamers are probably aware, the big stumbling block when it comes to including Legends (and other former NBA players) in current games is the issue of likeness rights. It’s another reason that the inclusion of Legends in NBA Live 2000 was such a big deal; much like complete (or at least, near-complete) classic teams in NBA 2K, we weren’t sure it was ever going to happen. Unfortunately, EA Sports weren’t able to get everyone on board in NBA Live 2000. The most noteworthy names absent from the roster of Legends would have to be Kareem Abdul-Jabbar, Clyde Drexler, Dennis Rodman, Nate Thurmond, and George Mikan. Nostalgia can be quite powerful, and we tend to have a strong attachment to the players we grew up watching. Although the discussions can get heated – and it’s difficult to overcome our respective biases – the players of today vs. the players of yesteryear is always going to be a popular topic among NBA fans. It’s tough to settle those debates in real life, and we obviously can’t see those match-ups actually play out, but we can at least have a lot of fun with them in basketball video games. It all started with those Legends in NBA Live 2000, and it’s been great to see historical content get bigger and better over the past seventeen years.